A few days ago, as I walked one of the corridors at Stormont, a member of staff quipped that he had been playing ‘Spot the MLA’. For months now this has been a place of pretend politics. It is a pretend Parliament Buildings. There is no functioning Assembly or Executive; the place has the feel of being abandoned. Yet a speech by Sinn Fein’s northern leader Michelle O’Neill on Wednesday seemed to suggest that there might still be a pulse in this talks process – however weak. We were told that the DUP and Sinn Fein were talking and we were pointed towards another and the next negotiation. On Monday British Secretary of State James Brokenshire will again meet five of the Stormont parties separately for bilateral talks, and then the two biggest parties will continue with their discussions. This is about working out the potential and the worth of yet another phase of round-table negotiations. Politics here is arriving at some tipping point. The O’Neill speech came just hours after comments by Irish Foreign Affairs Minister Simon Coveney brought a terse response in a UK Government statement. In the event of no Stormont Agreement, Coveney had spoken out loudly about “no British-only direct rule”; spoken in the context of the Irish Government’s role and responsibilities in relation to the Good Friday and subsequent agreements; and this after he had spoken at length on the urgent need to restore the Executive at Stormont. Plan A is his priority. He did not use the words Joint Authority. So, whoever wrote the UK Government statement either had not heard what he said or, worse still, had not understood what he was saying. What do these words tell us? That there is a nervousness attaching to any Plan B. That Plan A may not be possible. Coveney and Taoiseach Leo Varadkar are not spectators. They are participants in this process. The internal affairs of Northern Ireland in 2017 are not what they were in the early to mid 1970s. The March Assembly election ended the overall unionist majority at Stormont – “an outcome that sent shock waves across unionism,” commentator Alex Kane wrote in his Irish News column on Friday. A majority in Northern Ireland opposes Brexit and, in the June General Election, the nationalist/republican community turned its back on Westminster. It was in this election, that the DUP – with ten MPs elected – recovered from that March shock. It is in a stronger position in London – propping up the May Government – than it is in Belfast. This is why there may still be another Assembly Election before any deal – an election that would give the DUP a chance to add to its March numbers. 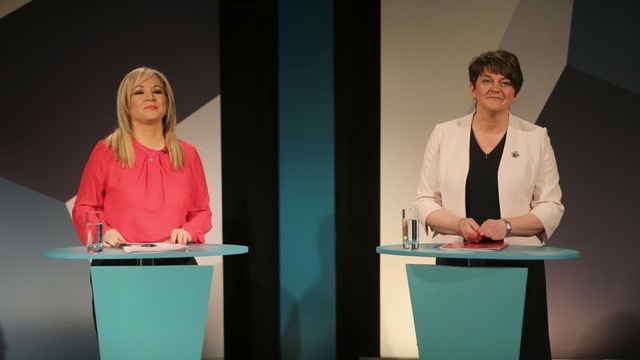 The Michelle O’Neill speech on Wednesday did not suggest there had been a significant shift – or any shift – in the positions the two main parties hold on a list of unresolved issues. Hours after the O’Neill speech, a DUP Assembly member told me that he believes that Adams has deliberately set the bar too high – at a height he knows the DUP cannot clear. That DUP politician does not believe there will be a stand-alone Irish Language Act or a resolution to the issue of marriage equality. Adams is not going to lower the bar – not this time. Nor, as Brokenshire prepares to meet the parties again, is there any indication of the DUP moving. In the here and now, Stormont may be beyond saving. Who knows when all 90 will return to the Assembly chamber. September 10, 2017 in News & Current Affairs. With any sort of justice in the world at all, the DUP will be the agents of their own demise. Head-in-the-sand attitudes will lead to revulsion and Brexit can only help. A hard border followed by a border poll in the next year or so will end NI as a functioning entity, and good riddance. The bar is being set high by broad republican and nationalism and the DUP still don’t get it. I firmly believe SF would have kept Stormont afloat in January had Arlene’s arrogance not pushed SF voter base beyond endurance. I thought the accepted version of why SF collapsed Stormont was because of the opinions expressed by their core support at a meeting in the Felons. Ten years in Stormont and nothing achieved sort of thing. We know for certain it wasn’t RHI as they held 57 Clinics promoting that and Connor Murphy even lobbied Jonathan Bell to keep it open longer.